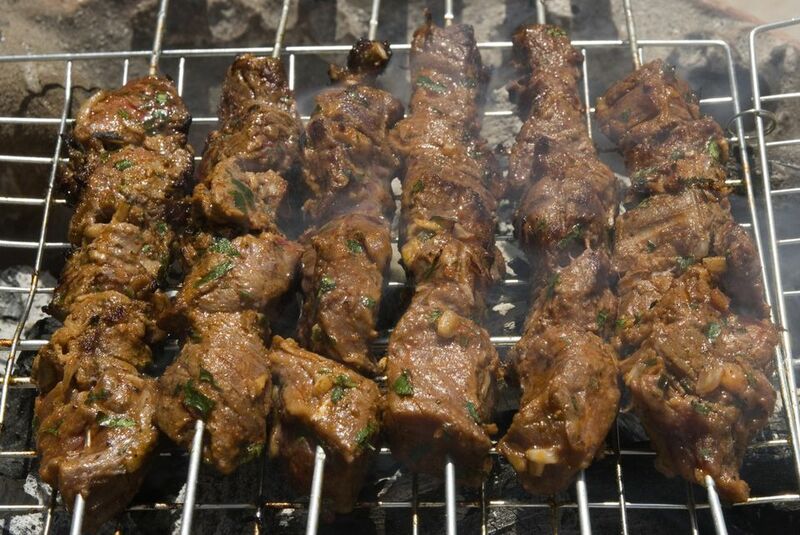 We grill all kinds of food year-round in Morocco and these lamb or beef brochettes among our very favorites. Usually reserved for special occasions, most notably in the days following Eid Al-Adha, they're best made with pricier, extra tender cuts of meat such as leg of lamb or fillet of steak. The traditional seasoning below includes lots of onion, herbs and zesty amounts of paprika, cumin, salt, and pepper. Cayenne pepper is optional; I do like to include it. For a simpler variation, you can omit the paprika and cumin and season only with the onion, herbs and salt and pepper. Vegetables are not traditionally threaded onto the skewers with the meat, but you can do so if you like. Serve Moroccan kebabs as an entrée, as part of a multi-course meal, or as a sandwich filler in crusty Moroccan bread or pita-like batbout. Tomato and Roasted Pepper Salad is a popular accompaniment and sometimes my in-laws offer Black Olive Tapenade as well. For best results you'll want to allow several hours or longer for the meat to marinade in the spices, so plan ahead. Serves four to six as a main course. Well suited for entertaining or special occasions. For a stovetop variation of Moroccan brochettes, try the tagine-style preparation of Kebab Maghdour. Trim excess fat from your meat then cut the meat into small, approximately 3/4" cubes. Wash and leave to drain in a colander while you gather and prep the remaining ingredients. Transfer the meat to a large bowl. Add the onion, parsley, cilantro, spices, oil and lemon juice. Use your hands to mix the meat with the seasoning, kneading it gently to ensure even distribution of the spices. Cover the bowl with plastic or aluminum foil, place in the fridge and leave the lamb or beef to marinate for at least two to three hours. An hour or so before serving time, thread the meat onto skewers and set aside. Light your grill or preheat your broiler to medium high. Cook the brochettes in batches for about 6 or 7 minutes on each side, turning several times, or until the meat tests done to your preference. Transfer the cooked brochettes to a plate and cover with aluminum foil to hold warm while you cook the remaining kebabs. Serve the brochettes with salads, breads, and condiments on the side.